This week's freebie is a deceptivally deep and useful tool from the worldful developers at Audiothing. On the surface it looks like a simple filter - something you might find on a number of DJ mixers. But Filterjam is actually a multi-band resonant filter allowing you to sum or multiply signals together according to the selected mode. 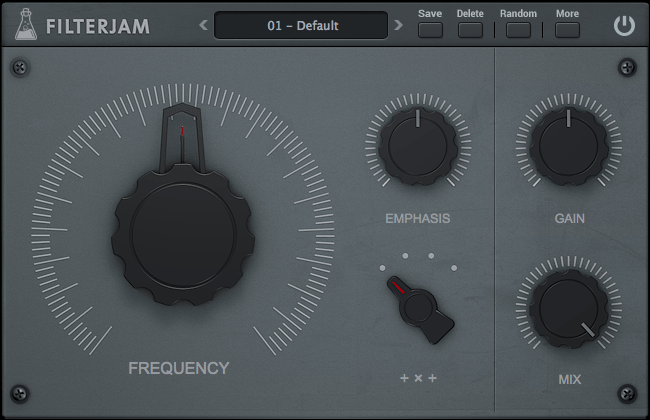 This makes it possible to create some really dramatic ring-mod style sounds, while still allowing Filterjam to craft subtle changes to your tone if that's what you want. Check out the Soundcloud demo and YouTube video below to hear and see the plugin in action. Filterjam just requires a signup for a free download, but it's also worth checking out Audiothing's other product line, with some really great value software on offer, many for less cash than a drunkenly ordered pizza delivery. Hurrah! Interested in synths, plugins and electronic music production? Why not take a look at our hugely popular BA (Hons) degree course?